Do you understand what knowledge is needed for different CM roles? Is information access well managed? Do you ensure against ‘tribal wisdom’? Do you have a database of the competency profiles of all staff? Do senior management take a clear lead in CM, cascading objectives down the organisation? Is the CUSTOMER culture defined, with key terminology for corporate personality, attitudes & behaviours? 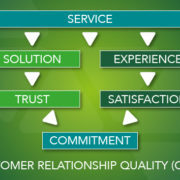 Do job descriptions reflect customer-oriented competencies? Is there a common approach to competency assessment & development? Do CM objectives drive staff recruitment, retention, development, reward, recognition & succession plans based on competencies required & valued? Do you utilise symbols of change and reinforce on-culture behaviours? Are you developing broad business managers rather than just product experts? 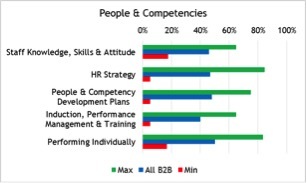 Is your competency development leading to high performance behaviours? Do customer-facing staff fully understand the proposition? 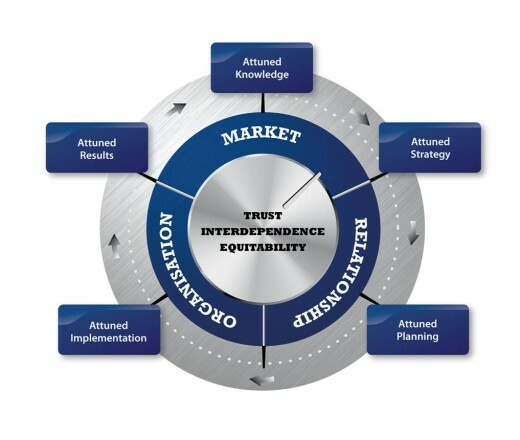 Does training include the principles of Trust, Interdependence & Equitability? Is negotiation & interpersonal style training in place? Is coaching part of your CM culture? Is the culture regularly assessed vs. required behaviours and rituals? Is there a formal & honest measure of how effectively staff feel they are being led? Are underperforming individuals given appropriate support/training/coaching; are they sensitively managed out if required? Are pay & benefits linked to CM performance? The chart shows the highest, lowest and mean (benchmark) scores for companies on the Customer Attuned database. The benchmarks show a slight dip in execution in this area, and that this could be an area of competitive advantage. The lowest scores registered show that some companies in the sector have no effective ‘customer culture’.